Of course, you can’t be in Another World without exploring the retail options. India is a textile lover’s paradise, with all sorts of fabrics both hand and machine woven, ranging from the humble to the outrageous. I can’t buy it all. In fact, I can’t buy very much, especially compared to the vast volume I covet. But I am keeping my eye out for special items, with special purposes in mind. First, I’ve written about Kasuti embroidery before. I’ve been on the lookout for an example, but so far, I’ve not seen anything. Not so much as scrap. Perhaps when we go to Kerala next month we’ll see some, but I suspect that given its intricate nature and simple presentation, it is not being made in quantity for sale any more, because other more showy work of less labor can sell for more. But I did find this piece. It’s NOT hand-made. 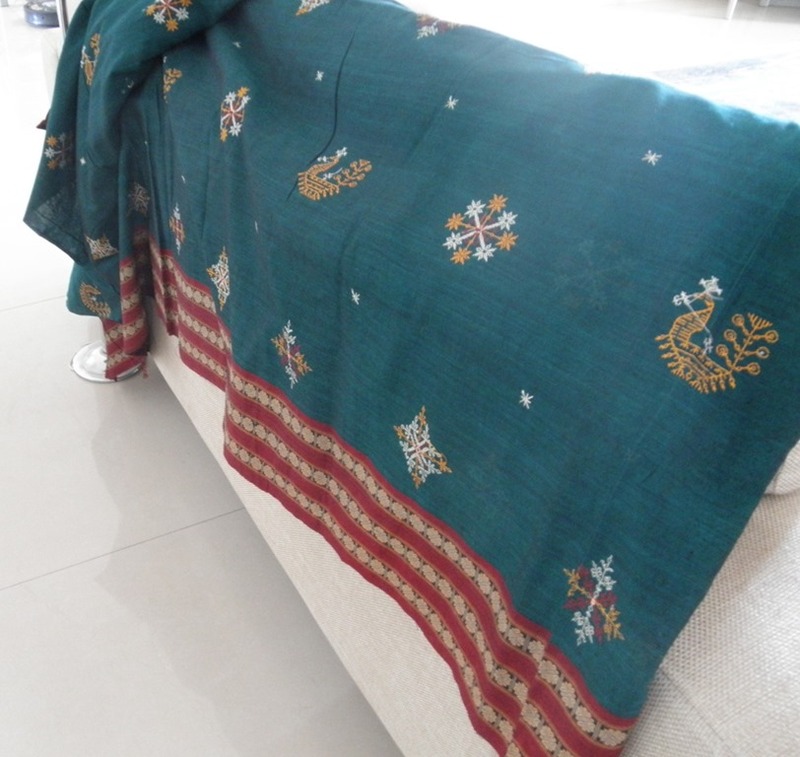 It’s machine embroidered sari, using traditional colors and patterns on an all-cotton ground. In terms of scale, the stitches are about twice as large as the museum pieces I saw here in Pune, and in Delhi. But it’s unmistakably part of the heritage, and the seller was very surprised that I recognized it as such. I have also found some trim for my long-delayed library curtain project. The 1 inch wide red paisley at the bottom is actually hand-stitched. I’m not sure what to do with the blingy gold at the top, but it was so over the top and of such a typical Renaissance configuration, that I had to buy it. A use will present itself, I am sure. 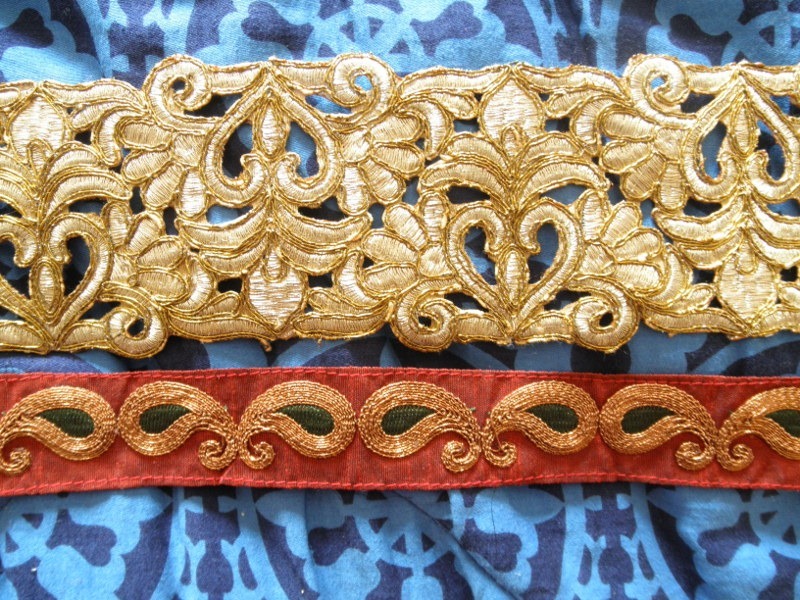 Aside: most borders and trims here in India are sold in single piece 9-meter lengths, the optimal length for application onto a standard sari. 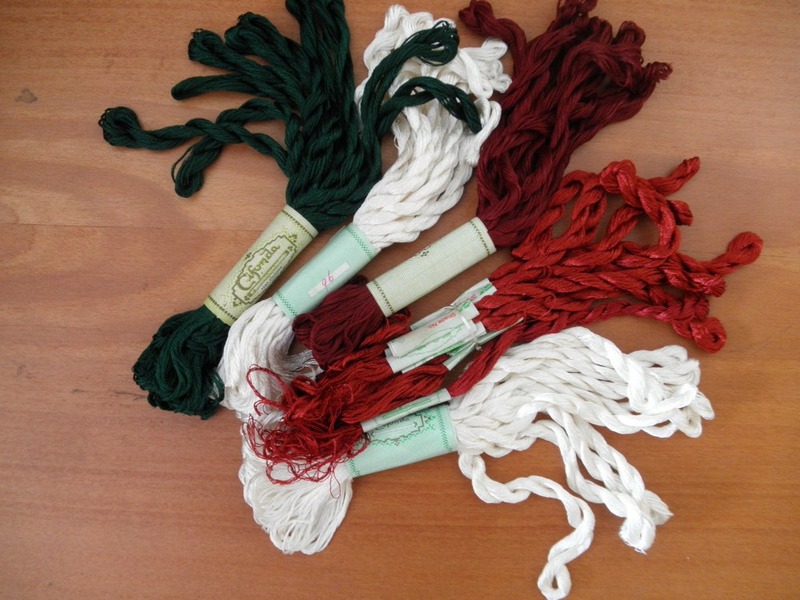 Also at the same store as the red trim, I found some silk embroidery floss. This stuff is quite fine, with the individual strands being significantly thinner than Soie d’Alger, my go-to silk for countwork. I got a bunch in assorted colors, each big bundle containing 10 skeins, and the skeins being 10 rupees apiece. That’s about 16 cents US at the current exchange rate. I will probably go back and get more, although the range of colors was rather attenuated. And finally, I got a yard of real silk canvas. 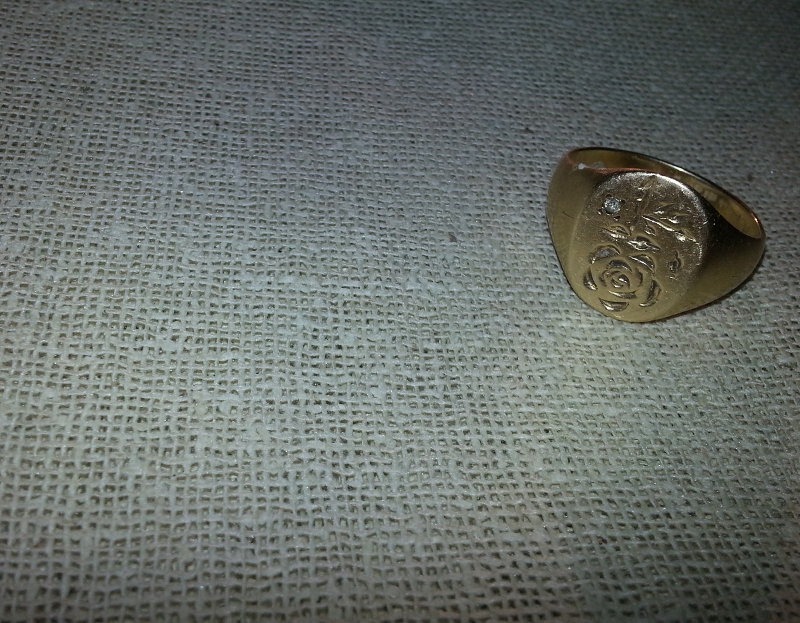 My signet ring is shown for scale. This is a 17th century sampler in the collections of The Art Institute of Chicago (Museum #2008.627). It’s worked on a gauze ground in darning and double running stitch (among others). It’s not going to happen any time soon, but the materials are now in my hands and ready. Here’s another piece we found on our Delhi/Agra trip. This came from a dealer in Agra, and not the fair trade market in Delhi. This is a patchwork wall hanging. 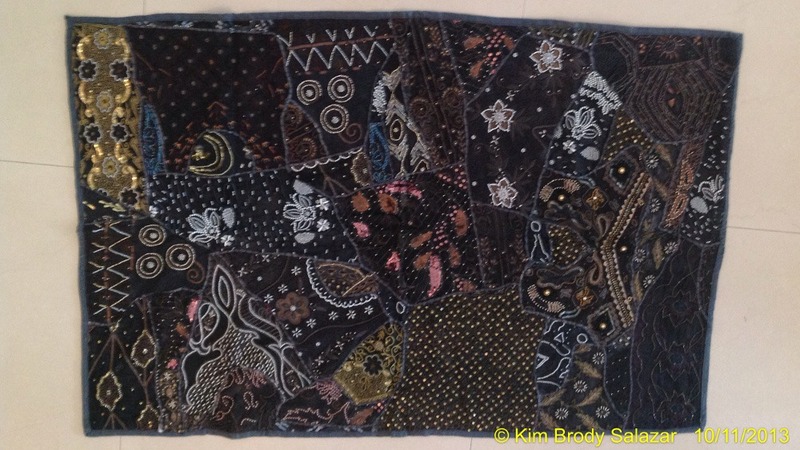 It’s sort of in Crazy Quilt style, although the piece is one huge block, roughly 4 feet x 2 feet. It’s made up of fragments of highly embellished antique textiles, much of it overdyed in black; plus some newer pieces to eke things out. The fragments are appliqued to totally cover a background, and that ground cloth is in turn backed by another heavier cotton cloth. 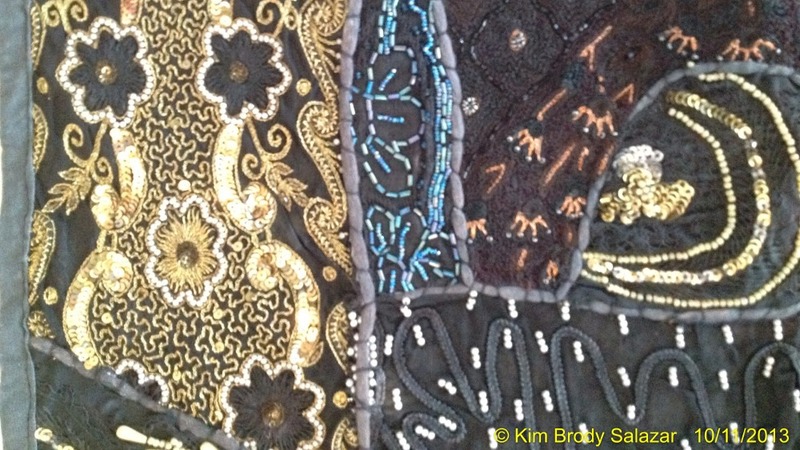 There is minimal quilting between the layers to hold them together – mostly some tacking stitches along the rolled borders between the fragments. The dealer had several like this. Believe it or not – this was the plainest. It was also the one in best condition. One problem with antique pieces is that often the cloth is not stable. Silk is friable, and crackles with age. All the more so when it has been overdyed. Threads securing hand-hammered sequins or rough edged metal beads can break easily. I looked long and hard at the five offerings, and picked the one in the best shape from a curator’s perspective. The number of techniques in this piece is hard to estimate. There’s tambour in silk, cotton and metal threads; beadwork and sequins applied in myriad ways; satin stitch, laid couching of various types; buttonhole stitch; something very much like or nuée, with gold threads affixed with colored silks in patterns or to create shaded effects; appliqued lace; some very old mirror work (shisha); and heaven knows what else. 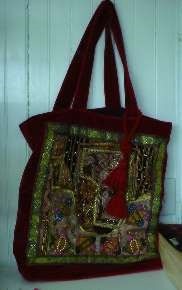 It’s also of Indian origin, assembled patchwork style from small pieces of sari borders and other embroidered snippets. In this case the backing fabric is cotton velour, instead of heavy flat-woven matte-finish cotton. I have a feeling that this bag is somehow related to the black hanging, if only distantly. But as jaw-dropping as the black piece is, it’s not our ultimate acquisition (so far). You’ll have to wait until the next post to see that!